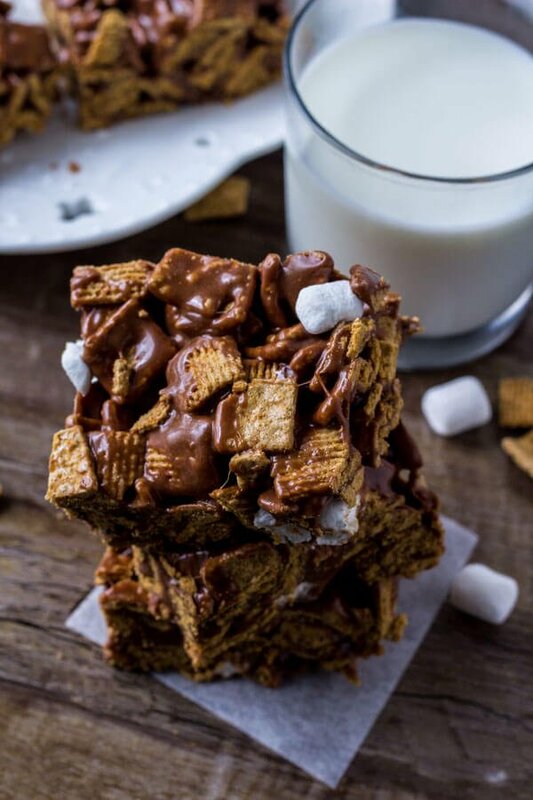 These Golden Grahams S’Mores Bars are gooey, chewy, a little crunchy, and the perfect way to enjoy s’mores indoors. 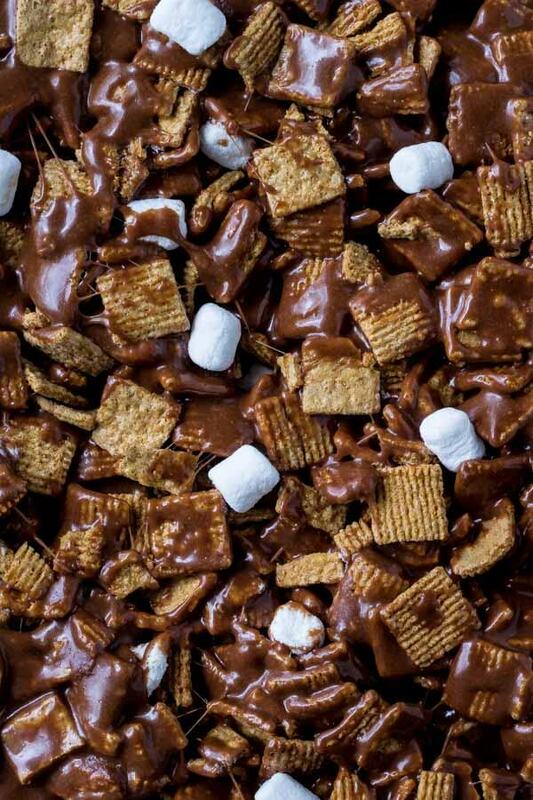 They’re like rice krispie treats and s’mores all in one. Growing up my family never went camping. 4 girls + potential for rain = a lot of complaining. But we always had campfires. And whenever there were campfires we ALWAYS had s’mores. 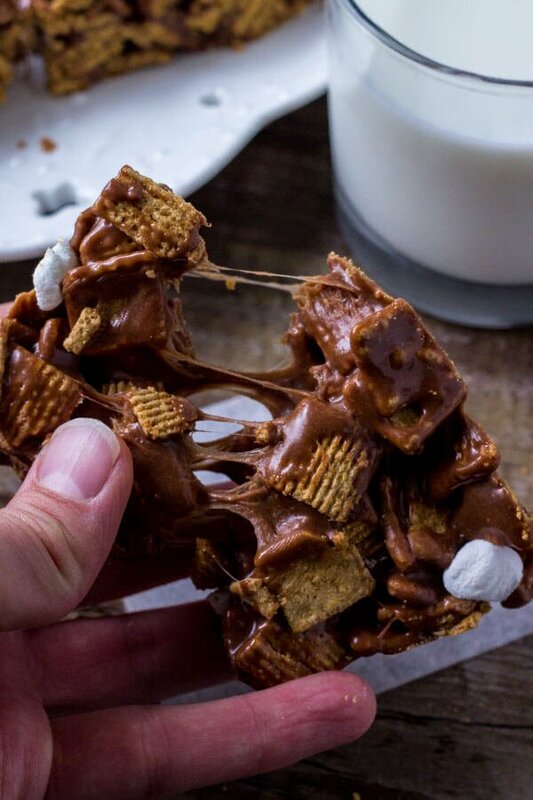 There was always an argument about what makes for the perfect s’more. Golden brown vs. totally burnt marshmallows, one marshmallow vs. two, plain milk chocolate vs. something a little different. But the debate over what makes for the perfect s’more just meant I’d have to try multiple varieties. Which was never a problem with me. This summer I don’t have any campfires planned soon though – I figured I’d get myself ready ready for s’more taste testing by starting it off with these Golden Grahams s’mores bars. and 7 cups Golden Grahams. 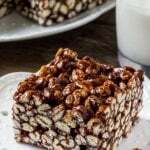 You can also make these Golden Grahams s’mores bars without corn syrup by using 1/4 cup sugar and 1 tablespoon of water instead. First melt together 5 cups of mini marshmallows (we’ll use the other cup of marshmallows later), 1 1/2 cups milk chocolate chips, butter and corn syrup in a large saucepan over low heat. The key here is to go slow so that the mixture doesn’t burn. Have the burner on low and gently stir with rubber spatula so that the mixture melts together. Then remove the pan from the heat and stir in the cereal and the remaining cup of mini marshmallows. You’ll need to work quite quickly here to mix everything together before the chocolate mixture starts to harden. 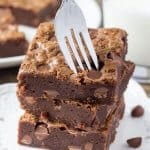 It’s quite sticky so it can be a little tricky, but if all the cereal isn’t perfectly covered it’s totally ok.
Then spoon the mixture into a buttered 9×13 inch pan (make sure it’s buttered – otherwise the bars get stuck in the pan), and push it down flat with your rubber spatula. You can lightly grease your spatula to make the process a little easier too. Then just try to wait an hour for them to harden. (It’s tough – I know). 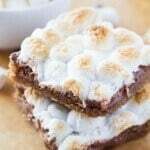 You’ll notice that some recipes for Golden Grahams s’mores bars use 8 cups or a full box of Golden Grams. I like mine a little more gooey and a little less crunchy, so I only used 7 cups. If you prefer them a little crunchier, feel free to 8 cups instead. 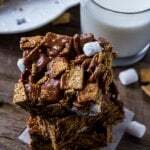 If you’re craving s’mores but don’t have a campfire in your near future (or fire pit in your backyard), then these Golden Grahams s’mores bars are just the thing you need in your life. 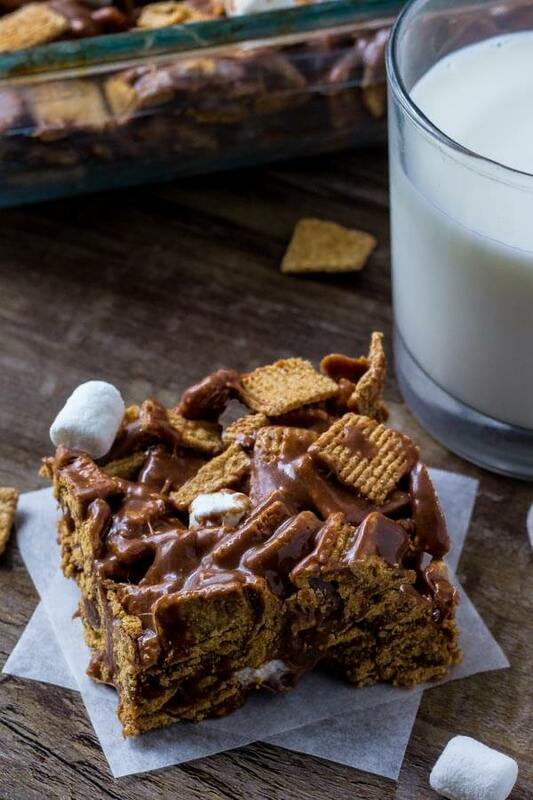 These Golden Grahams S'Mores Bars are gooey, chewy, a little crunchy, and the perfect way to enjoy s'mores indoors. Butter/grease a 9x13 inch baking pan. 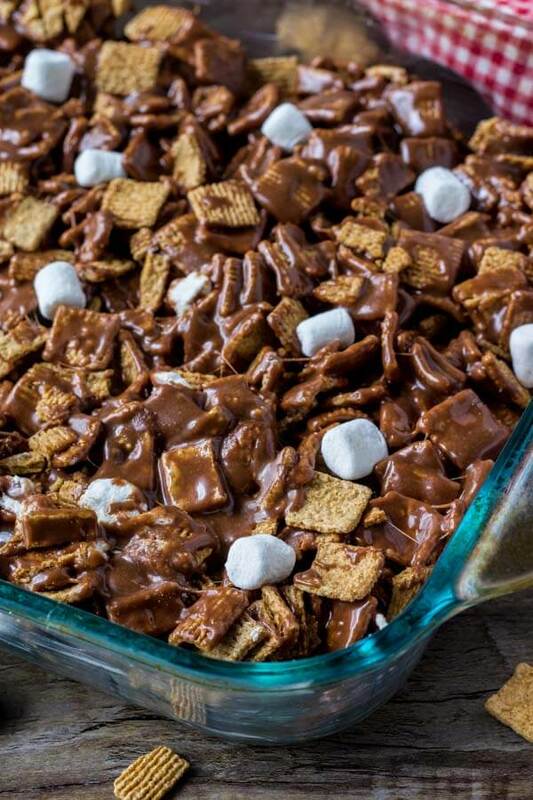 Add 5 cups marshmallows, milk chocolate, butter, and corn syrup to a large sauce pan. Melt the mixture together over low heat while gently stirring with a rubber spatula. Once melted remove from the heat (place on a heat proof surface) and immediately stir in the cereal and remaining cup of marshmallows. It will be very sticky. Spoon the batter into the prepared pan and flatten down using the back of your spatula (lightly greasing the spatula can help). Allow to harden at room temperature for 60 minutes before cutting into squares. 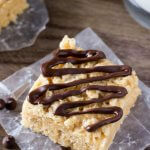 *If you don't have corn syrup use 1/4 cup of sugar and 1 tablespoon of water instead. **Store bars in an airtight container at room temperature. I don't recommend storing them in the fridge because they can get too hard. Gimme, gimme, gimme! 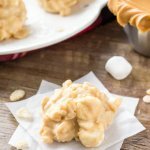 These look like the perfect after-dinner snack. Yum! Whoa!!! There are no words to describe my amazement for this dish.